Digital transformation is on everyone’s mind – which isn’t surprising given that digitalization is providing real, measurable benefits to organizations which are early adopters. It is clear that in today’s world, companies that do not embrace digital transformation risk becoming obsolete. However, for every company, especially for large well established companies and brands, digital transformation carries an opportunity but also has its risks –risk of failing by being disrupted by new business models, or by not being able to make the technology transition required for this new era. 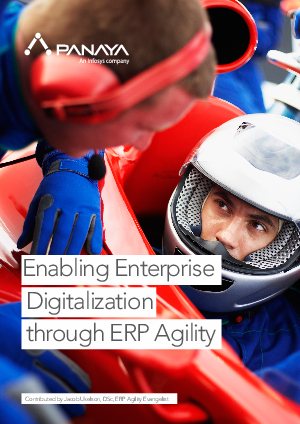 To be successful during digital transformation, organizations must possess agility and speed, and their ERP must adapt by increasing delivery velocity, without compromising quality. In this whitepaper, we explore methodologies and best practices to achieving IT agility for critical enterprise applications (e.g. ERP) in the era of digital transformation. For many companies these applications are at the core of what they do, and agility is a top requirement for them to become a full partner in digital transformation.